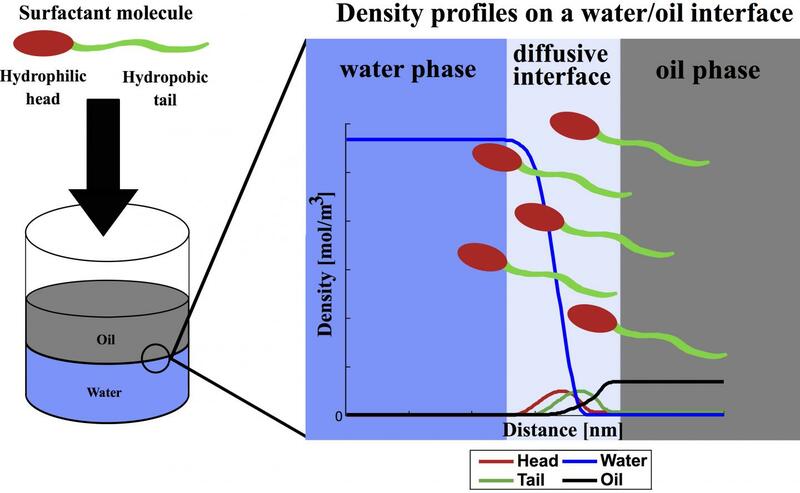 A Rice University group's innovative surfactant theory removes limitations of a 100-year-old model for interfacial behavior in enhanced oil recovery. The lab of Rice chemical engineer Walter Chapman customized a well-worn model to analyze surfactant-containing fluids that are pumped into wells to coax as much oil possible out of rocks deep underground. To accomplish the modeling task required a shift in thinking for the lab that uses sophisticated mathematical models to analyze how fluids interact with each other and the structures that contain them. The researchers employed a standard thermodynamic modeling method known as density gradient theory (DGT), which has been used to predict the interfacial properties of pure and mixed systems. They modified the DGT model to better characterize surfactant molecules that in reality are far more complex than previous models allowed for. That could help producers squeeze even more oil out of wells that would otherwise be considered played out. The work led by Chapman and Rice graduate student Xiaoqun Mu appears in the American Chemical Society journal Industrial & Engineering Chemistry Research. The molecules in surfactants have hydrophilic (water-attracting) and hydrophobic (water-avoiding) parts. Soap is a type of surfactant designed to separate contaminants from skin or fabric and allow them to be carried away by water. Surfactants work much the same way in wells, where they reduce the surface tension between rock, water and oil, releasing the oil to be pumped to the surface. Oil producers like to know how a surfactant will react once it reaches a rich formation. Because experimental measurements are expensive and time-consuming, many models have been developed to predict surfactant effects. Until now, the DGT formulas used to predict those reactions have treated surfactant molecules as a single point rather than the complex chains they really are. "That's a limitation in the models," Chapman said. "The DGT model has never had the capability to describe how fluid properties are affected by the shape of the molecule." Mu drew inspiration from Rice colleagues who build computational models with density functional theory, which is used to analyze the structures of atomic and molecular systems. "I've been using DGT since the first year of my Ph.D., so I had a quite comprehensive understanding of the model's pros and cons. Its nature kept us from applying it to molecules with amphiphilic (surfactant) chain structures," he said. "But the model is simple compared to others, and we saw the potential to extend it to handle surfactants. "Inspired by our group's work on density functional theory, we created the idea that the surfactant molecule can be modeled in DGT by connecting a hydrophilic head group to a hydrophobic tail group," Mu said. "With the help of several colleagues, we developed a simple way to add this chain-formation term into density gradient theory." Accounting for the surfactant's sophistication isn't enough; the model also has to include temperature, pressure, composition and other conditions in the well. When combined, it incorporates more of the physics at play between all the molecules and gives engineers a better idea of the appropriate mixture to inject. Because surfactants are part of so many industrial products, such as detergents and dispersal agents, Chapman said the modeling technique could have wide application. "We want our density gradient theory to be simple enough that people can make use of it," he said. "DGT is supposed to be a faster calculation to do." To that end, Mu said nothing was held back from the publication. "We have attached a very detailed appendix," he said. "We're explaining 100 percent of how we derived and applied this model so people can implement it or further improve it." Co-authors are Rice graduate student Shun Xi and Faruk Alpak of Shell International Exploration and Production Inc. Chapman is Rice's William W. Akers Professor of Chemical and Biomolecular Engineering and associate dean for energy at the George R. Brown School of Engineering. Shell International Exploration and Production Inc. and the Robert A. Welch Foundation supported the research. Read the abstract at https://pubs.acs.org/doi/10.1021/acs.iecr.8b00164.